Home > IE Spaces for Innovation Prize > 5SFI1029 - The connected Era - .Freedom . flexibility . transformation. Nowadays imagining the future is no more of a challenge because it has already started with seismic shifts in the way we live creating a significant change in humans’ behavior. So what’s fueling this fire? The short answer is technology; the main driver for human productivity that some of us never thought possible. We’ve moved from an information society to a knowledge society where technology is enhancing our ability to learn, teach and apply our knowledge to varying situations at a prompter and smarter pace. This shift is creating a new generation of connected workers who have developed a more diverse skill-set and range of abilities and has created new forms of communication and work styles. In turn, this new workforce has different priorities regarding their vision for work and life, and is unrestricted by things like time, money and space. We’re in the middle of a transformation. 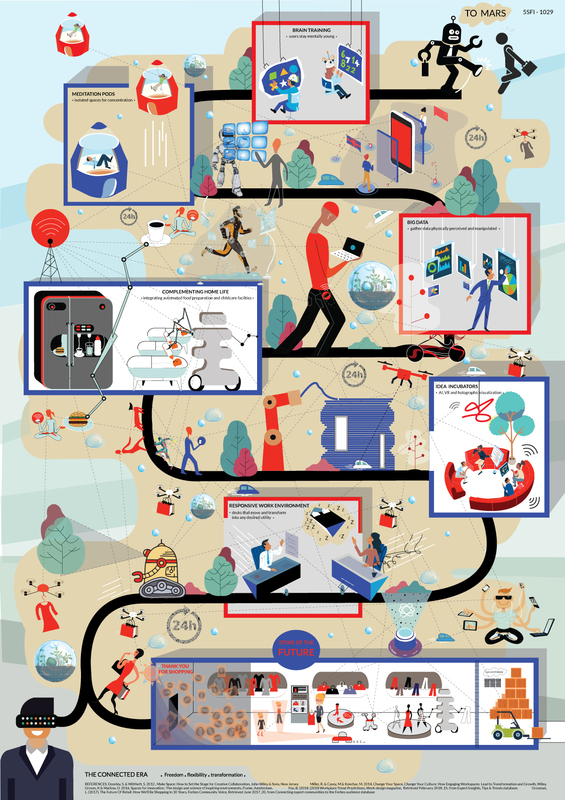 The future of the work, retail and learning environments is turning on its head. The traditional workplace is dying as mobility takes hold. Offices with outdated design are damaging our wellbeing and mental health and killing our productivity. Rather, a comfy seat, a well-equipped laptop and a place to connect are the only requirements to building the next big thing. The trend has switched to collaborative workspaces and tools, flexible schedules and the ability to transcend borders. The idea of how we work and where we work defines this new and ergonomic working space that heals rather than hurt us; the office of the future is healthy, harmonious and happy. The spaces of the future will be more intelligent, and no longer bound within the confines of an office or behind walls. Natural light, plants and bright colors will all together merge a more welcoming, relaxing and motivating living space. Spaces will have more integrated services such as food, gym, laundries, hairdressers, banks, childcare facilities; preparing food, feeding toddlers is not a concern anymore while at work. All is automated and monitored remotely. Retail spaces will also be converted to a more customized experience backed by AI systems that would meet customers’ expectations. Not only will it save time for retailers since this technology is self-functioning; but it will also mean that customers get hyper-personalized experiences based on real-time data or hologram virtualization. For instance, if you don’t like shopping because either you prefer being left alone, or do not want to change and try on clothes you like; the virtualization and personalization will back your privacy. In fact, ideas of the future are unlimited and can be rendered by any Sci-Fi imagination. At this pace, humans will be able to conquer and achieve anything beyond reach. In short, transformation is inevitable, and change is good. The future is all about freedom and flexibility, as the new philosophies to dominate today’s concept of workplace – to build great things.